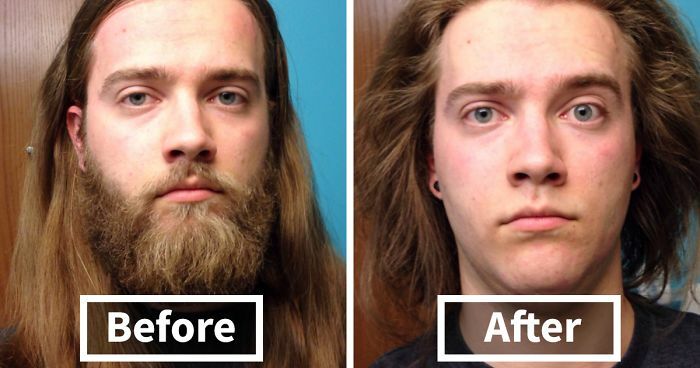 Growing out a beard can dramatically change a man's look, but shaving one off can be even more of a shock, revealing the dreaded post-shave baby face. Some say that the right choice of beard styles make men's faces look stronger and more masculine, while others argue that it all comes down to bone structure. We're definitely not evolutionary scientists here at Bored Panda, but we've compiled some photos of guys before and after grabbing the razor, and we'd like to know which one you'd rather ride off into the sunset with. Beards certainly have their place in this world, and they do a lot more than just aiding in human mating rituals. Bearded men, especially with thick facial hair, can boast about having a healthy balance of bacteria in their stubbles that are actually good in keeping skin healthy, according to a 2014 study published in the Journal of Hospital Infection. Male hospital workers in the US who were in the habit of shaving beards had higher amounts of harmful bacteria present on their faces than their bearded counterparts, possibly due to the damage skin often sustains after a shave. The youthful glow of a smooth look is worth a few nicks, though, and shaving has also been proven to scrape away dead skin cells. It's hard to say whether having a beard is healthier or not, but it's undeniable that men with beards are either a hit or miss in aesthetics. Check out a whole list of before-and-after shaving comparisons below, and just try to believe that it's the same person in each photo. You have a very neat and orderly face. The beard destroys that neat look. Who knew there was such a nice face buried under all that hair! Definitely sexier with a short beard. I really liked that long hair though! looks better without the beard! Noooo!!!!!!!! Don't keep the beard. Super good looking without! He looks great either way, because of his happy eyes and relaxed nature. I'm not a 'beard person' but his beard is almost perfect on him. Looks like a friendly college professor. He's a winner. Love the Salvador Dalí crazy look at the end! Handsome either way, but better without the beard. What a great jawline! Your beard was amazing ! A genuine happy face would solve all your problems, with or without the beard. Without beard - almost Nick Rosberg! #39 A Friend Of Mine Shaved His Year-Long Beard And Recorded "The Process"
Looks better and younger without the beard. Mission accomplished. Short beard and moustache would make you look great. #49 This Is My Plight Every Year For Movember... Yes, Thats A Soul Patch. All or nothing - great face though! You have a lovely friendly smile! #62 Fun With Shaving... It's Off! From drunk jokester at the bar, to "hello, I'm Matt, your personal gym trainer". aww, no! keep shaving, why hide that handsome face under all that hair? That million dollar smile is a closer either way ! I think a short beard and kinda long hair would be the perfect combination for you. You're handsome anyway. Grow that beard back. And take care of it. Great eyes! Don't distract from them with a wild beard. SO young without the beard! With the beard he looked like a Viking warrior, without it looks like one of Santa's elves.